4, the wearing of the green or of the faith Saint Patrick? Readings: Tobit 13: 1b-7; Psalm 145: 1-13; II Corinthians 4: 1-12; John 4: 21-38. In the name + of the Father, the Son, and the Holy Spirit, Amen. We have come to the end of our “mini-retreat.” Next Thursday [17 March 2016], hundreds of Saint Patrick’s Day celebrations are taking place worldwide. In Dublin, Belfast, Cork, Galway or Limerick, if you find yourself in the centre of the major cities on this island, you will need to have your wits about you as you collide into drunks and revellers. I wonder sometimes whether we make too much of Saint Patrick’s Day … and whether we have emphasised the wrong traditions. During the course of this “mini-retreat” this weekend, we have examined both the myths and facts surrounding Saint Patrick, and we have looked at the Patrician mission and the pre-Patrician roots of Irish Christianity. But we cling onto Saint Patrick’s Day as if everything we think, say and do in regard to the patron saint’s day is part of sacred, national myth. People who say things like Vincent Twomey said some years ago are dismissed as myth-busters, killjoys and spoilsports. But Saint Patrick’s Day never was at the heart of Irish identity, and never was at the heart of commemorating the arrival of Christianity in Ireland. 1, Saint Patrick’s Day does not date back to Saint Patrick’s days. It is also a feast day in the calendar of the Western Church since the mid-17th century, thanks to Luke Wadding (1588-1657), a Franciscan theologian from Waterford who founded Saint Isidore’s College, the Irish College in Rome. He claimed Saint Patrick had died on 17 March, and encouraged his students to remember the saint on that date each year. But the commemoration was almost unknown, even in Ireland. 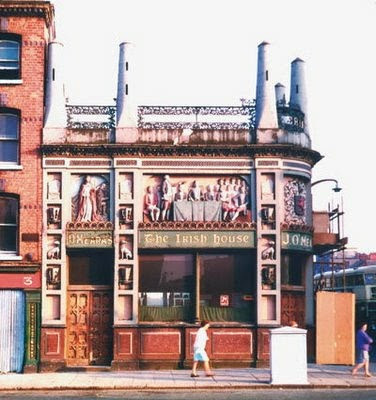 In 1629, Pope Urban VIII asked Luke Wadding to reform the Roman Breviary and calendar, his cousin, Patrick Comerford, Bishop of Waterford and Lismore, wrote to him, stressing the importance of including Saint Patrick in any new list of saints: “For your life … endeavour that at least a semi double be accorded to Saint Patrick.” And so 17 March entered into the official Christian calendar as a feast day in 1632. 2, If Saint Patrick is dressed for Saint Patrick’s Day in all those posters, statues and stained glass windows, then he is dressed in the wrong liturgical colour ... the correct liturgical colour for his day is white, not green. Despite all those songs about the “wearing of the green,” despite green floodlighting at Saint Patrick’s Cathedral, for over 1,000 years Saint Patrick’s hue was blue. Blue is still the official colour of Saint Patrick’s Cathedral, Dublin, the official colour of the President and the official colour of the National Stud. Before partition, the strip of the Irish football team, representing the whole island, was Saint Patrick’s Blue. 3, The Saint Patrick’s Day Parade is not an Irish invention or tradition. The first recorded Saint Patrick's Day Parade in the world took place in Boston – on 18 March 1737. The first Saint Patrick’s Day Parade in New York was staged by Irish troops in the British army in 1762, most of them probably Protestants, perhaps as a recruiting drive for the British army. Today, the parade in New York is the longest and the oldest in the world. 4, The Cork village of Dripsey has the world’s shortest parade – a total of 23.4 metres from The Weigh Inn pub to The Lee Valley bar at each end of the village. But the Dublin parade only dates from 1931. It began as a military parade, and its present form, with bands and music, only dates from 1970. 5, At first, the Church of Ireland Gazette strongly opposed Saint Patrick’s Day becoming a public national holiday … because it would lead to too much drinking. 6, Saint Patrick’s Day has been a public holiday in Ireland for only little more than a century. In 1903, Luke Wadding’s hometown, Waterford, became the first city to declare Saint Patrick’s Day a public holiday. But 17 March only became a public holiday throughout Ireland later that year when Parliament in Westminster passed a bill introduced by the MP for South Kilkenny, James O’Mara. 8, When the law eventually forced pubs to shut in 1927, TDs were still worried about sales of wine from chemists and so-called “dairy shops.” One politician was worried about women getting prescriptions filled and slipping a sly bottle of port into their handbags. So, before we finish this retreat and go from here, prepared to celebrate Saint Patrick’s Day next week, and to enjoy ourselves, let us take to heart Vincent Twomey’s recent comments as a timely reminder that the central truths of the faith Saint Patrick preached on this island – the life, passion, death and Resurrection of Christ – are more important than any commemoration – secular, civic or religious – of the saint’s life. Let us, like Paul and Patrick, let us enter into the labours of those who have gone before us (John 4: 38) and seek to “Let light shine in the darkness … to give the light of the knowledge of the glory of God in the face of Jesus Christ” (II Corinthians 4: 6). (The Revd Canon Professor) Patrick Comerford is Lecturer in Anglicanism, Liturgy and Church History, the Church of Ireland Theological Institute. This sermon was preached at the Closing Eucharist at a Diocesan Readers’ Lenten retreat on 11-12 March 2016. 3, Celtic Spirituality, is there something there? 11.15 a.m.: Celtic Spirituality, is there something there? Some years ago, I spent an autumn’s afternoon in Glendalough, looking for what I thought would be the remains of a great Celtic monastery. Imagine my surprise when I found that the most prominent Celtic High Cross I was taking photographs of – one that stands beneath the Great Round Tower – was a gravestone erected in the late 19th century. A few more Celtic myths were shattered that afternoon: the Great Round Tower was capped in the late 19th century too, so as we see it today is not as it once stood; even Saint Kevin’s Church is an 18th century church, built according to plans derived from an earlier sketch by a French or Swiss artist. Our images of Celtic spirituality are often shaped by Victorian romanticism. 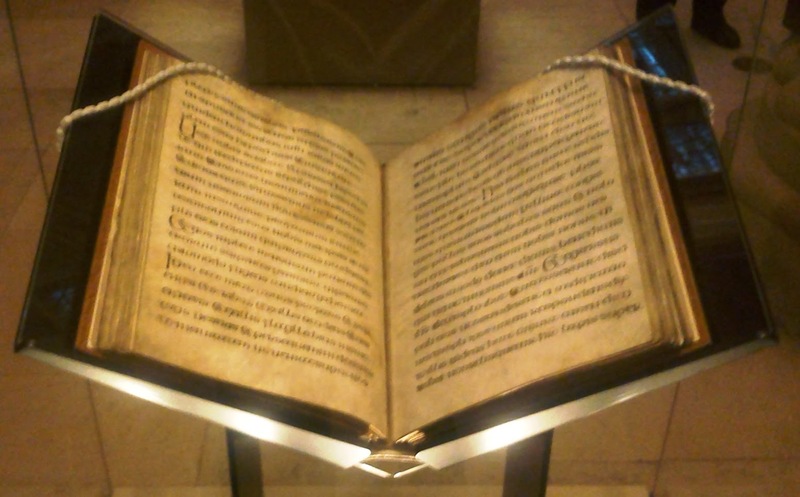 Saint Patrick’s Breastplate, as we know it, is based on a manuscript from the late 11th century now in the Library of Trinity College Dublin. But it was only published in 1897 by John Henry Bernard (1860-1927), later Church of Ireland Archbishop of Dublin (1915-1919) and Provost of Trinity College Dublin (1919-1927). Sometimes, our images of Celtic Spirituality are intricately linked with the nation-state-building myths created by an Irish nationalism that was often narrow in its vision. Yet, Be thou my vision (Hymn 643, the Church Hymnal, was versified by a member of the Church of Ireland, Dr Eleanor Henrietta Hull, using another translation of an earlier poem or prayer. But often the vision of the nation myth-makers was of an Ireland in which anything they regarded as “Celtic” was wrapped up with a narrow, exclusive concept of being green, Gaelic, Catholic, nationalist and Irish. The popular images of Saint Patrick at that time in stained-glass windows, road-side statues and popular postcards show him standing on a bed of shamrocks decked in the robes and mitre of a truly Tridentine bishop. Of course, I would point out that green is the wrong liturgical colour both for Lent and for a saint’s day. But why was he never seen in those popular portrayals in convocation robes or in a simple alb and stole? Because the message was clear: Celtic Christianity was for Roman Catholics only, and at that for a particular type of Catholicism. And yet we did something similar in the Church of Ireland in the 19th century. antiquarians posing as historians claimed Patrick, and every other Celtic saint they could find, for Protestant Christianity, as opposed to Roman Christianity … as if Christianity in Ireland before the 12th or 13th centuries was pure from heresy, undefiled by superstition and out of touch with the Continental European Church. Nor was Celtic Christianity the only formative influence on the Church in Ireland as it moved from the mediaeval period towards the Reformations. The Preamble and Declaration of 1870 describe the Church of Ireland as “the Ancient Catholic and Apostolic Church of Ireland” – what a title. But that ancient and catholic church is not just Celtic; it was influenced and shaped too by other cultural forces, including the Vikings, Anglo-Normans, and many others. Hopefully this will continue in the future, with the Romanians, Nigerians, Chinese, or others. It may be that the economic woes of the past decade or so have made us despise the Celtic Tiger. But Celtic Spirituality is still a fashionable commodity when you look at the shops around Christ Church Cathedral or go shopping for small presents in Dublin Airport before a flight. Much of what passes as “Celtic” and as “Celtic Spirituality” is tatty and second-rate. But there are compelling reasons to have a sound grasp of Celtic spirituality in the context of ministry in Ireland today. 1, Firstly, many of the cathedrals and churches of the Church of Ireland stand on ancient Celtic monastic sites. 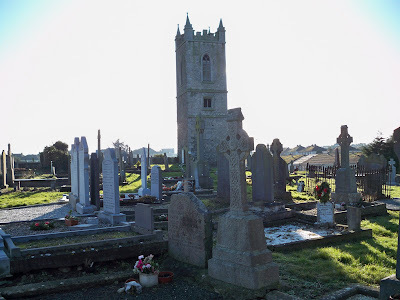 If you have ever wondered why so many Church of Ireland cathedrals – Achonry, Ardagh, Clogher, Clonfert, Elphin, Emly, Ferns, Kilfenora, Kilmacduagh, Kilmore, Leighlin, Raphoe, Rosscarbery – are in small villages or remote locations, or why it took so long to build cathedrals in Belfast, Enniskillen, or Sligo, or why still we have no cathedral in Galway, then you begin to realise the lasting influences of the Celtic monasteries. It is important to know the minds of people, to know what engages them spiritually, what passes as religion for many if we are going to be incarnational in our ministry and mission. 3, And thirdly, modern spirituality, in a dynamic way, has drawn on and has been enriched by many resources associated with Celtic spirituality, enriching the life of the Church of Ireland at every level. There are at least 20 hymns from the Irish language in the Church Hymnal, and many more tunes with a Celtic air to them. We have all been enriched by the prayers of the Iona Community, the hymns of John Bell, Graham Maule and the Wild Goose Worship Group, the active and engaged spirituality of the Corrymeela community, or the resources of the Northumbria Community near Lindisfarne. The global reception of the hymns of John Bell and Graham Maule show how there is a fresh and new interest in Celtic Spirituality that is not confined to Ireland. At an academic level, this interest has been stimulated by scholars such as James Mackey, Ian Bradley in the Church of Scotland, the Jesuit Diarmuid Ó Laoghaire (1915-2001), the Carmelite Peter O’Dwyer and the Redemptorist John Ó Ríordáin, and writers such as the late John O’Donohue, poet and author of Anam Cara (1997) who died about six years ago [4 January 2008]. The Celts: who were they? If we are going to talk about Celtic spirituality, I should begin with caution: it is difficult to say if there was such a group of people as Celts. The name for Celts comes from terms used by the Greeks and Romans to describe the people who lived in Gaul (France). But scholars differ when they answer the question: Who were the Celts? Did they originate in southern Europe, or in what is now southern Germany and Austria? Or did they come from the Pontic-Caspian region? Strabo suggests that the Celtic heartland was in southern France. Pliny the Elder says the Celts originated in southern Portugal and Spain. But how did they reach the remote Atlantic coasts and islands of Western Europe we now know as the “Celtic fringe”? “Celt” is a modern English word. There are few written records of ancient Celtic languages and most of the evidence for personal names and place names is found in Greek and Roman authors. The names used by Greek (Κελτοί, Γαλᾶται) and Latin writers (Galli) refer to speakers of similar languages, but not to a people. The one group of Biblical Celts are named in two New Testament letters: the Letter to the Galatians, and also I Peter (see I Peter 1: 1). Saint Jerome (AD 342-419), in his commentary on the Epistle to the Galatians, notes the language of the Anatolian Galatians at his time. Romantic antiquarian interest popularised the term “Celt,” but only from the 17th century on. Because of the rise of nationalism and Celtic revivals from the 19th century on, the term “Celtic” is now used to identify the languages and cultures of Ireland, Scotland, Wales, Cornwall, the Isle of Man and Brittany. But the term “Celtic” also applies to Continental European regions with a Celtic heritage but no Celtic language, such as northern Iberia, and to a lesser degree France. “Celticity” refers to shared cultural indicators, such as language, myths, artefacts and social organisation. But does that shared culture and family of language imply a shared ethnicity? There is little archaeological evidence in Ireland for large inward Celtic migration. European Celtic influences and language may have been absorbed gradually. But did the Celts arrive in Ireland by invasion? Or did their culture and language spread gradually to other peoples already here? As one writer in The Irish Times argued, just because we all eat pasta and pizza, drink Chianti, holiday in Tuscany and are decked out by Versace and Gucci, does not make us Italian, even culturally. Nor does it indicate there was ever an Italian invasion of Ireland. Were the Celtic languages and cultures adopted as some sort of early fashion statement? Can we talk about a Celtic Christianity? Can we talk about a “Celtic Christianity” with distinguishing, unique traditions, spirituality, liturgies and rituals that mark it out from other traditions in the Church in the neighbouring sub-Roman world? “Celtic Christianity” broadly refers to early mediaeval Christian practices that developed around the Irish Sea in the 5th and 6th centuries, among many people on these islands. By extension, the term can refer to the monastic networks founded from Scotland and Ireland on Continental Europe, especially in Gaul (France). The term “Celtic Christianity” is sometimes extended beyond the 7th century to describe later Christian practice in these areas. But the history of the churches on these islands diverges significantly after the 8th century, with great differences even between rival Irish traditions. It is easy to exaggerate the cohesiveness of the Celtic Christian communities. The term “Celtic Church” is inappropriate to describe Christianity among Celtic-speaking peoples. Celtic-speaking areas were part of Latin or Western Christendom as a whole. But we can talk about certain traditions in Celtic-speaking lands, and the development and spread of these traditions, especially in the 6th and 7th centuries. Britain was the most remote province in the Roman Empire. Christianity reached England in the first few centuries AD, and the first recorded martyr in England was Saint Alban, perhaps between 283 and 304, certainly long before Saint Patrick’s time in Ireland. The Roman legions were withdrawn from England in 407, Rome was sacked in 410, the legions did not return to England, and Roman influence came to an end. In the aftermath, these islands developed distinctively from the rest of Western Europe, and the Irish Sea acted as a centre from which a new culture developed among the “Celtic” peoples. Ireland was never part of the Roman Empire. But Christianity came here from the former Roman outposts, and a unique Church organisation emerged, focussed on the monasteries, rather than on episcopal sees, with their own traditions and practices. Key figures in this process included Saint Ninian, Palladius and Saint Patrick, the “Apostle of Ireland.” Ireland was converted through the work of missionaries from Britain such as Patrick and others. Early Celtic saints and founding figures of the Church included Saint Martin in France, Saint Ninian in Scotland, Saint Patrick and Saint Brigid in Ireland, and Saint Samson and Saint David in Wales and Brittany. In the 6th and 7th centuries, monks from Ireland established monastic settlements in parts of Scotland. They included Saint Columba or Saint Colmcille, who settled on Iona. Ireland became “a land of saints and scholars” and missionaries from Ireland became a major source of missionary work in Scotland, Saxon parts of Britain and central Europe. As the Anglo-Saxons colonised what is now England, Celtic missionaries from Scotland and Ireland worked among them. In the year 631, Saint Aidan was sent from Iona to evangelise them from the island of Lindisfarne, on England’s north-east coast. Celtic practice heavily influenced northern England, and the missionaries from Lindisfarne reached as far south as London. Irish monks were also settling in Continental Europe, particularly in Gaul (France), including Saint Columbanus, and exerting a profound influence greater than that of many Continental centres with more ancient traditions. Meanwhile, in 597, Pope Gregory sent a mission to the English, led by Saint Augustine. These renewed links with the greater Latin West brought the Celtic-speaking peoples into close contact with other expressions of Christianity. Episcopal structures were adapted to an environment wholly different from that in the sub-Roman world. Apart from parts of Wales, Devon, and Cornwall, the Celtic world was without developed cities, and so different ecclesiastical structures were needed, especially in Ireland. This ecclesiastical structure developed around monastic communities and their abbots. Celtic Christianity was often marked by its conservatism, even archaism. One example is the method used to calculate Easter, using a calculation similar to one approved by Saint Jerome. Eventually, most groups, including the southern Irish, accepted the new methods for calculating Easter, but not the monastery of Iona and the houses linked to it. In Ireland, a distinctive form of penance developed, where confession was made privately to a priest, under the seal of secrecy, and penance was given privately and performed privately as well. Handbooks, called “penitentials,” were designed as a guide for confessors and to regularise the penance given for each particular sin. In the past, penance had been a public ritual, but had fallen into disuse. But the Irish penitential practice spread throughout continental Europe, and Saint Columbanus is said to have introduced the “medicines of penance” to Gaul. In the 19th century, there was a revival of interest in Celtic spirituality in these islands, with renewed interest in the poetry, customs or household prayers of the western Celtic fringes. It coincided with a similar revival in political and artistic circles. Hymns mentioning high towers were written in the same decades in the late 19th century as the Round Tower was restored and capped in Glendalough, a Round Tower was erected at the grave of Daniel O’Connell in Glasnevin Cemetery, and, as part of the Victorian Arts and Crafts Movement, my great-grandfather decorated the top storey of the Irish House, a pub that stood beneath Christ Church Cathedral, with a series of rising round towers. The Gaelic Athletic Association was formed in 1884, the Gaelic League by Douglas Hyde, a rector’s son, in 1893. Our most popular English-language version of Saint Patrick’s Breastplate, Frances Alexander’s I bind unto myself today (Church Hymnal, 322) was first sung and published as late as 1889. The English-language version of Be thou my vision by Mary Byrne and Eleanor Hull (Church Hymnal, No 643), which refers to God as “my high tower,” was only translated and versified in 1905, and was first published in a hymnal in 1915. In Scotland, many ‘Celtic’ poems and prayers were collected and edited by Alexander Carmichael in his Carmina Gadelica (1900) and in Ireland by Douglas Hyde in the Religious Songs of Connacht (1906). In 1938, George MacLeod, a Church of Scotland minister, rebuilt Iona’s ancient Abbey, and founded the modern Iona Community. Since the 1980s, Celtic-style books of prayers by the Revd David Adam, Vicar of Lindisfarne, have become widely popular, as has a wave of books about Celtic Christianity, study courses, and Celtic interest networks. For centuries, the riches of Celtic spirituality were transmitted orally. These included prayers sung or chanted at the rising and setting of the sun, in the midst of daily work and routine, at a child’s birth, or at a loved one’s death. There were prayers of daily life celebrating God as Life within all life, with creation as his dwelling place. Christ is the supreme example of a complete human life. By being united to him, we can learn how to be fully human by finding a body-mind-intuition balance, and by growing in wisdom and, above all, love. Early Celtic Christians shared their food, money, work, play and worship in little communities which were always open to the people who lived around them. Wherever they lived they saw Christ in their neighbour and made community with them. Celtic writers talked about worshipping God with the “five-stringed harp” – meaning all five senses. The Celtic churches punctuated each day and night with periods of prayer. The Celts prayed about anything and everything in a natural way. Prayers for frequent activities were learned by heart and handed down by word of mouth or later in writing. I will do my household chores as would Mary, mother of Jesus. I will travel to my next place in the presence of the angels of protection. Who is that near me when I am sad and alone? It is Jesus, the King of the sun. The most famous of the armour or breastplate prayers for protection is known as Saint Patrick’s Breastplate. This invites God’s force-field to strengthen us for life’s struggles. The praying person then confronts negative forces one by one, invites Christ into each situation, and repeats the opening invocation. Spirit give you the fruits of friendship. Weave well in you as you sleep. – Ray Simpson, Celtic Blessings. 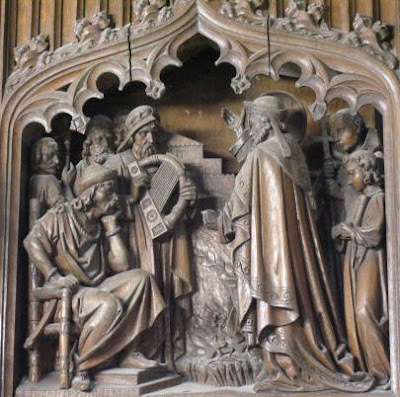 In Celtic Christianity, saints were regarded as holy spiritual overlords who were close to God, provided assistance in times of need, had special influence in the court of heaven, and were able to plead with God for favours. Many miracles were associated with them, including visions, healings, favours granted, mystical appearances and more. Places where miracles had been performed became pilgrimage sites. Celtic Christians recognised the importance of shared spiritual journeys, and their Anamchara or Soul Friend, was their spiritual director. Anamchara were sought out as men and women of wisdom, great spirituality and insight, who were willing to share their understanding of the faith with others. Apart from Saint Patrick, we ought to be familiar with some other Celtic and Irish saints from this period and tradition. Saint Brigid is said to offer protection to poets, blacksmiths, healers, cattle, dairymaids, midwives, new-born babies and fugitives. The numerous stories of miracles performed by her even in childhood convey the impression that she was really a person of compassion, charity and strength. Her practicality and resourcefulness were shown by fetching well water that tasted more like ale for a sick servant, or picking up rushes from the floor to twist into a cross to explain the message of salvation to a dying man. Her generosity frequently relied on prayer to make good the deficit. Her father Dubtach was a pagan nobleman in Leinster, and her mother his Christian bondwoman, Brotseach, whom he sold to a Druid who lived at Faughart near Dundalk. There the child was born in the mid-5th century (ca 451 or 453) and baptised Bríd or Brigid. It is said that as a child she was taken to hear Saint Patrick preaching, and as she listened to him she fell into an ecstasy. At about the age of 14, instead of accepting marriage, she opted for the religious life. She left home with seven other young girls and travelled to Co Meath where Saint Macaille was bishop. 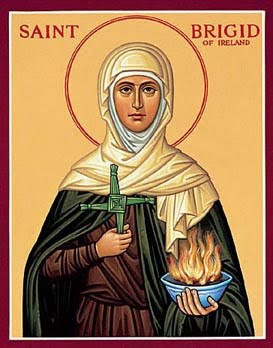 Brigid founded the first convent in Ireland. She went to Ardagh to make her final vows before Saint Mel, a nephew of Saint Patrick, and he is said to have mistakenly ordained here. Later, a unique community of monks and nuns developed at Kildare, with Brigid as Abbess of the nuns and Conleth, the first Bishop of Kildare, as Abbot of the monks. Kildare became a centre for spirituality and learning, healing, faith-sharing and evangelism. I long for Jesus too to be there among them. Saint Columba (9 June) is intimately associated with Iona, off the west coast of Scotland – and is credited with bringing Christianity to Scotland. But he is also linked to a number of Irish monastic foundations, including Kells, Co Meath, and Derry. He was born in Co Donegal in 520 into a wealthy royal family and was given the name Colum (“the dove”). He became a priest at a monastery founded by Saint Finian and spent many years in his home region establishing hundreds of churches and monasteries. When Columba still refused to give back his copy, a clan war broke out between the king’s followers and Columba’s supporters. Many people were killed in the fighting, and a shamed Columba accepted “white martyrdom” – exiling himself from his homeland as a penance. In 563, at the age of 42, Columba and 12 companion monks sailed in a currach to Iona, where they settled and founded a monastery. Iona became the largest Christian centre in northern Britain, attracting thousands of monks, and later became a centre for missionary outreach to the highlands of Scotland. my children, and love one another. both in this world and in the world to come. Iona Abbey, and the Iona Community founded in the 1930s by George MacLeod, continue to inspire Christians today throughout the world. Saint Cuthbert was born in the Scottish border country near Melrose. One night, he had a vision of a great light, stretching from earth to heaven. He learned later that on that same night, 31 August 651, Saint Aidan, Bishop of Lindisfarne, had died. To the young shepherd, the vision seemed to be a challenge and a call to serve God. He entered the Monastery of Old Melrose and there he spent 13 years as a monk. Eata, Abbot of Melrose, took Cuthbert with him to Ripon where they entered the monastery together. Cuthbert later returned to Melrose as Prior in 661. As prior, he took part in the Synod of Whitby in 664, when he accepted the synod decisions on the date of Easter and the tonsure. Cuthbert returned to Lindisfarne as Prior but then travelled throughout Northumbria. In search of a solitary life, he built a round cell and chapel south of Lindisfarne, and he lived there for eight years, devoting his time to prayer. 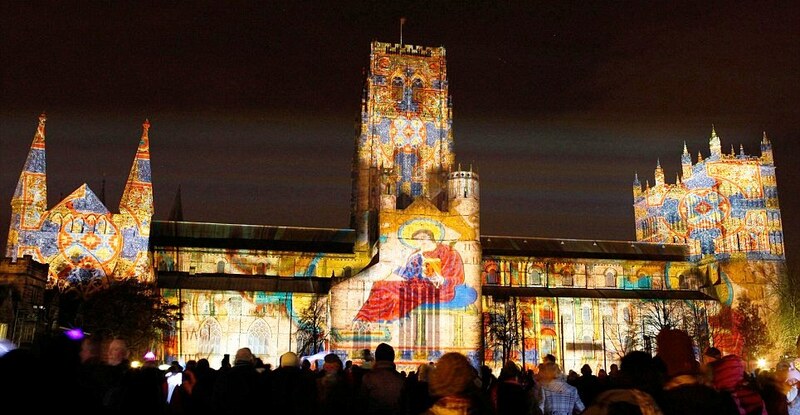 Following in Saint Aidan’s footsteps, he was consecrated Bishop of Lindisfarne in York on Easter Day, 26 March 685. He died in 687. During the Viking raids in Northumbria in 875, Saint Cuthbert’s followers moved his body and carried it from place to place for safety. In 883, he was buried in Chester-le-Street and in 996 he was reburied in Durham Cathedral, where his shrine remains to this day. Glendalough, Co Wicklow: Glendalough in the Wicklow Mountains, 25 miles from Dublin, is the best preserved “monastic city” in Ireland, with its round tower, seven churches and visitor centre, which tells the story of Saint Kevin. Skerries: a monastery associated with Saint Patrick was first located on the islands off the shore, before moving to the site of the present Church of Ireland Parish Church, Holmpatrick, where the ruined tower behind the church stands on the height of the monastic site. Iona: Saint Columba established his monastery on Iona in the 6th century. The modern Iona Community was founded in 1938 as an ecumenical community committed to seeking new ways of living the Christian faith in today’s world. Whithorn: Saint Ninian founded the first large Christian community here in the 5th century. Saint David’s and Saint Non’s: Saint David’s Cathedral is near the site of the great monastic community founded by the patron saint of Wales. At nearby Saint Non’s, a well and retreat house mark the traditional site where Saint David’s mother, Saint Non, gave birth, and is the start of a coastal pilgrim trail. Lindisfarne, Northumberland: Lindisfarne has sometimes been described as the “cradle of English Christianity.” Alcuin, adviser to the Emperor Charlemagne, described Lindisfarne as “the holiest place in England.” From Lindisfarne, Saint Aidan and Saint Cuthbert spread the Christian faith north and south. Whitby, Yorkshire: The ruins of Saint Hilda’s Abbey and the Caedmon Cross in the churchyard opposite stand out on the cliff top site. This was once the largest English monastic community for men and women. Today, the Order of The Holy Paraclete offers retreat accommodation at Saint Hilda’s Priory. Durham: The shrine of Saint Cuthbert is at Durham Cathedral. Lichfield: Saint Chad, who was educated at an Irish monastery ca 651-664, established the church in Mercia, the pre-Norman Kingdom of the English Midlands, and died in 672.The Book of Chad, now one of the great treasures of Lichfield Cathedral, predates the Book of Kells by about 80 years. Earlier this month, I was in Lichfield Cathedral for the patronal festival of Saint Chad [2 March 2016], who is described on the cathedral website as an Irish-born saint. Certainly, he seems to have been trained in an Irish monastery. 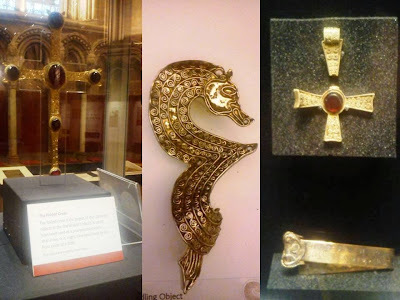 Over the last few years, I visited on a number of occasions exhibitions in Lichfield Cathedral of recent finds in a large Anglo-Saxon horde near Lichfield. This discovery points to an interesting interaction between the Saxons of Mercia and the Celtic church in Northumbria and perhaps even Ireland before the arrival of Saint Chad. Bradwell, Essex: The 9th century chapel in Bradwell was founded by Saint Cedd of Lindisfarne. David Adam, Border Lands (Sheed & Ward) … the best of David Adam’s Celtic vision. This is a compilation of four of his most popular books and includes prayers, meditations and Celtic art. David Adam, The Eye of the Eagle (Triangle) … the reader is taken through the hymn, Be Thou My Vision, in a search for the spiritual riches that are hidden in all our lives. Ian Bradley, The Celtic Way (London: Darton, Longman and Todd, 1993) ... the Revd Ian Bradley, a Presbyterian minister in the Church of Scotland, has lectured in the Department of Theology in the University of Aberdeen. This is a good, sound introduction to Celtic spirituality. Celtic Daily Prayer from the Northumbria Community (London: Harper Collins, 2000) … an introduction to daily prayer drawing on resources from the “Celtic Church” throughout these islands, with good notes and introductions to further resources. Elizabeth Culling, What is Celtic Christianity? (Nottingham: Grove Books, Grove Series No 45). The Iona Community Worship Book (Glasgow: Wild Goose, 1994 ed). Lemuel J. Hopkins-James, The Celtic Gospels, their story and their text (Oxford: Oxford University Press, 1934/2001) … Hopkins-James transcribed the Book of Chad in 1934. Marian Keaney, Celtic Heritage Saints (Dublin: Veritas, 1998) … introduces us to scholars, adventurous sailors, saints who get their heads chopped off, friends and enemies of kings. Good for using in schools, Sunday schools, and with confirmation classes. Diana Leatham, They Built on Rock (London: Hodder & Stoughton). This book tells the stories of the Celtic saints who maintained their faith during the Dark Ages. The people profiled include Saint Cuthbert, Saint Ninian, Saint David and Saint Columba. James P. Mackey, An introduction to Celtic Christianity (Edinburgh: T&T Clark, 1995 ed) … a collection of essays by 14 of the best experts on Celtic Christianity, including mission, liturgy, prayers, hymns and the arts. Caitlín Matthews, Celtic Devotional: daily prayers and blessings (Dublin: Gill & Macmillan, 1996/2004). Patrick Murray, The Deer’s Cry (Dublin: Four Courts Press, 1986) … a useful anthology of poetry and verse. Peter O’Dwyer, Céilí Dé: Spiritual reform in Ireland 750-900 (Dublin: Editions Tailliura, 1981) … the story of the movement within Celtic monasticism that gave us Saint Maelruain’s Monastery in Tallaght and the Derrynaflann Chalice. Pat Robson, The Celtic Heart (London: Fount, 1998) … a collection of Celtic writings celebrating the seasons of life by an Anglican priest living in Cornwall. It includes short biographies of saints and influential figures. Michael Rodgers and Marcus Losack, Glendalough: A Celtic Pilgrimage (Dublin: Columba Press, 1996) … a useful guidebook to our nearest Celtic monastic foundation. George Otto Simms, Commemorating Saints & Others of the Irish Church (Dublin: Columba Press, 1999) … biographical notes and suggestions for intercessions. Ray Simpson, Celtic Blessings (Loyola Press) … how many of us have whispered an impromptu prayer to our computer, begging it not to crash? Celtic Blessings reveals such actions are part of an ancient and sacred ritual. Ray Simpson, The Celtic Prayer Book (Kevin Mayhew) … The Celtic Prayer Book is published in four volumes: 1, Prayer Rhythms: fourfold patterns for each day; 2, Saints of the Isles: a year of feasts; 3, Healing the Land: natural seasons, sacraments and special service; 4, Greater Celtic Christians: alternative worship. Ray Simpson, Exploring Celtic Spirituality (Hodder & Stoughton) … the chapters of this book feature different aspects of Celtic spirituality, including cherishing the earth, contemplative prayer and the healing of society. There are prayers and responses at the end of each chapter. 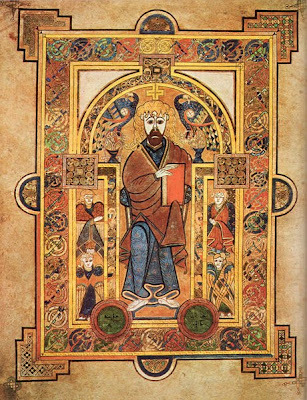 Martin Wallace, The Celtic Resource Book (London: Church House Publishing) … the whole breadth of Celtic Christianity is spanned here – from liturgies and prayers and the stories of Celtic saints, through to Celtic art. The book includes liturgies for different times of the day, for use at home or in larger groups. (The Revd Canon Professor) Patrick Comerford is Lecturer in Anglicanism, Liturgy and Church History, the Church of Ireland Theological Institute. This is the third address at a Diocesan Readers’ Lenten retreat on 11-12 March 2016. The myths and legends about Saint Patrick that encrust Saint Patrick’s Day have not been there for that long. But those legends and myths have been there long enough to mean that anyone who questions them or tries to get to the truth about Saint Patrick, to talk about the real man behind the story, is dangerously close to a folk concept of heresy. We help to massage those myths and legends in churches and cathedrals throughout the Church of Ireland with our stained glass windows depicting Saint Patrick with mitre and crozier, standing on the head of a snake. The dates of Patrick’s life are the subject of conflicting traditions. His own writings provide nothing that can be dated more precisely than the 5th century. Even though Patrick quotes in his writings from the Acts of the Apostles as they are rendered by the early fifth-century Bible-version known as the Vulgate, these quotations may have been added later to replace other quotation from an earlier Bible-version and can therefore not be used securely to fix dates for Saint Patrick or his writings. For example, the Letter to Coroticus implies that the Franks were still pagans at the time of writing. Their conversion to Christianity is dated to the period 496-508. Two Latin works survive which are generally accepted to have been written by Saint Patrick. These are the Declaration or Confession (Confessio), and the Letter to the Soldiers of Coroticus (Epistola), from which we have the only generally accepted details of his life. The Confession is the more biographical of the two works. In it, Saint Patrick gives a short account of his life and his mission. However, most available details of his life are from subsequent hagiographies and annals, and these are now not accepted without detailed criticism. In his writings, Saint Patrick shows his learning as he uses the Scriptures and scriptural allusions to make his arguments. The language he uses has been described as a popular or vulgar form of Latin from the 5th century, similar to that in Gaul at the time. But there is a level of sophistication in Saint Patrick’s thoughts and in the literary structure of his writings. My father was Calpornius. He was a deacon; his father was Potitus, a priest, who lived at Bannavem Taburniae. His home was near there, and that is where I was taken prisoner (Confessio 1). Where was Bannavem Taburniae? Although we can suppose that it was near the west coast of Britain, but we do not know its exact location. The Latin term that Patrick uses for the family home, uillula suggests the family had reasonable economic means and was of a particular social class. Patrick’s reference to his father Calpornius as a deacon and to his grandfather Potitus as a priest (patrem habui Calpornium diaconum filium quendam Potiti presbyteri) (Confessio 1) implies a family background of married clergy. Calpornius’ dual role in church life (deacon) and civic life (decurion) was not unusual in the late 4th or early 5h century Roman empire, when the clergy were fast becoming the administrative in the provinces. Patrick insists in his Epistola that he ‛was born free, in that I was born of a decurion father’ (Epistola 10). Indeed, for a man to be ordained, it meant he was a freeman. He says that after his six years of slavery in Ireland he returned to Britain, where his family “welcomed me as a son, and they pleaded with me that, after all the many tribulations I had undergone, I should never leave them again” (Confessio 23). Was Saint Patrick celibate or was he married with a family of his own? In the 5th century, many bishops were married. But from the late 4th century, a shift was taking place in Christian attitudes towards sexuality so that marriage and saintliness began to be seen as incompatible. Church Fathers at the time, such as Jerome, argued that those dealing with heavenly things should be celibate, while those who were married could deal with earthly things. Saint Augustine had already adopted a monastic and celibate form of life along with his monks. Patrick does not tell us whether he was ever married or not but, given that in his writings he mentions with approval “monks and virgins of Christ” (monachi et virgines Christi) (Confessio 41; Epistola 12), praises women who have remained virgins (Confessio 42), and speaks of ‘the chastity of genuine religion’ that he has ‛chosen to the end of my life for Christ my Lord’ (Confessio 44), we may presume that Patrick was celibate. In his writings, Patrick describes himself as rusticissimus (Confessio 1) and indoctus (Epistola 1), a simple country person and one unlearned. Yet, as the son of a Romano-Briton family of moderate wealth, he would have had a Roman-style education in the basic skills such as reading, writing and public speaking. What do we find in Patrick’s Confessio, more than 1,500 years after it was first written? 3, confessio laudis, confession of praise. All three understandings of confessio are found in Patrick’s writing. It was there that the Lord opened up my awareness of my lack of faith. Even though it came about late, I recognised my failings. So I turned with all my heart to the Lord my God (Confessio 2). His confession or testimony of faith appears in his inclusion of a formal creed concerning the Trinity: ‘This is the one we acknowledge and adore – one God in a Trinity of the sacred name’ (Confessio 4). Saint Patrick writes in his Confessio that the time he spent in captivity was critical to his spiritual development. He explains that the Lord had mercy on his youth and ignorance, and afforded him the opportunity to be forgiven of his sins and converted to Christianity. It seems Saint Patrick wants at the outset to proclaim the orthodoxy of his Christian beliefs. Had these beliefs been called into question? Why did Saint Patrick need to write this confession, declare his faith, and give an account of God’s dealings with him? These circumstances seem to have prompted Saint Patrick to write his Confessio. Yet it is more than a mere apologia. It is a testimony to Saint Patrick’s personal faith and trust in God, to whom he attributes the entire success of his mission in Ireland. Saint Patrick may be referring to his conversion and his new-found faith during the hardships of his slavery, or to the criticisms of his seniors back in Britain. Either way, he is convinced that his humiliations have been the fertile seed-ground for the effective working of God’s grace in his life. His Confessio highlights Saint Patrick’s growth in faith and trust in a personal and loving God as the inner source of his strength, especially through his many difficulties, and as the author of whatever success his mission has accomplished. He records his fervour in prayer as a young man while in slavery in Ireland; his later spiritual experiences, with an example of severe temptation as he was sleeping one night (Confessio 20). He records his escape from slavery (Confessio 21-22), how he later heard God’s call to walk again among the Irish (Confessio 23), and his experience of the Spirit praying within him (Confessio 25). Much of Saint Patrick’s Confessio offers us a retrospective view of things: he probably wrote it in his later years, as an old man. From this it may be assumed that his Epistola was written at some earlier period in his mission in Ireland, although we do not know precisely. The Epistola, or Letter, is shorter than his Confessio. It has been given a number of titles, including Letter to Coroticus and Letter Excommunicating Coroticus, for it is a letter of excommunication addressed to Coroticus and his soldiers. Coroticus and his soldiers had attacked a number of Saint Patrick’s newly baptised converts and had carried them off into slavery. Roman imperial rule was decaying, especially in Britain as the Roman legions were withdrawn, and it was a period marked by disorder. It seems from the Letter that the marauders led by Coroticus included some who were nominally Christian, Otherwise, why would Patrick want to or need to excommunicate them? Saint Patrick condemns the crime of Coroticus and his soldiers as a rejection of God’s gift of life and as a rebellion against God. They are to be treated as apostates. The crime is compounded because their victims are fellow Christians. When Saint Patrick speaks of Coroticus (see Epistola 2), he uses a Latin form of the name. The identity and origin of this Coroticus have been debated. Some say he was the c ruler of the Strathclyde region in what is now Scotland, Others identify him with Ceretic, a Welsh ruler. The placename is said to refer to Dumbarton on the Clyde, in a region close to the Picts. This reference to “monks and virgins of Christ” (monachi et virgines Christi) also occurs in the Confessio, where Saint Patrick praises the great number of people, both men and women, who have embraced the monastic life despite opposition from relatives (Confessio 41-42). These two works give us only a limited overview of Saint Patrick and his personality. But they reveal his relationship with God and his humble acknowledgement of God’s grace at work in his life, from his conversion as a slave to his mission as a bishop. He is a man who knows adversity and suffering but who is resilient and who perseveres in his trust in God. He is hurt by the accusations against him, feels betrayed and believes he has been undermined in the eyes of his superiors. The Letter to Coroticus portrays a Saint Patrick who is robust in his pastoral concerns. It is worth pointing out that there are no references to the shamrock, no indication of snakes being driven out of Ireland, and no naming of the mountain where he tended animals as a slave. The Hill of Slemish and Croagh Patrick are not named, and Lough Derg is not mentioned either. Nor is there any allusion to the Paschal Fire on the Hill of Tara near Slane, Co Meath. There is no reference to King Laoire either. All of these elements in the popular stories about Saint Patrick come from later writings, stories and traditions. Over time, the cult and status of Saint Patrick took on such proportions that we depend less on historical narrative and more on hagiography for these folk talks and legends. 1, Saint Patrick was not an Irishman. It might be an anachronism – or more correctly a prochronism – to describe him as such. But you can get my point when I say Saint Patrick was an Englishman. We like to think of Christianity being brought from Ireland by wandering Irish monks on their peregrinations through Europe in the Dark Ages. But Saint Patrick came from a Christian society that had arrived in our neighbouring island generations beforehand with the Romans. Considering we are marking the centenary of the 1916 Easter Rising this year, perhaps Saint Patrick’s family background challenges Irish people to be more generous in Anglo-Irish relations. Certainly Saint Patrick’s family background should put to shame people in Ireland who still use denigrating and derogatory phrases such as “Brits” that smack of racism. Saint Patrick reminds us that being English and being Irish is about as close as you can get in nationalities. When it comes the readings at our closing Eucharist in the Chapel this afternoon, our first reading [Tobit 13: 1b-7] may remind us that the good news of God’s kingdom is not for one, confined or limited group of people, but for all nations, throughout all ages. 2, Saint Patrick did not teach about the Trinity using the shamrock. That is legend. And if he did use the shamrock, he was perilously close to the heresies of either tritheism, at one extreme, or modalism at the other. When we see one leaf, we do not see the whole shamrock, when we see two leaves we do not see the whole shamrock. The Father is fully God, the Son is fully God, the Holy Spirit is fully God, but they do not work independently of each other, and cannot be torn apart and shredded, or held up as one God, each on their own like little idols or totems. But the Trinitarian challenge from Saint Patrick must force us to ask many questions. If we do not have a Trinitarian faith, how can we enter into the dance with the Trinity, the perichoresis (περιχώρησις) of the Trinity? We can end up making our own gods, in our own image and likeness, rather than entering into a relationship with the God who makes us in God’s image and likeness. What are our idols today? For example, did we destroy our economy in Ireland in the past decade because we made little gods of our money, our banking system and our quest for growth that benefitted a few at the expense of the many? 3, Saint Patrick did not expel the snakes from Ireland. The incident is not mentioned by Saint Patrick in his own writings and does not appear in the stories about him until the 11th century. But, in the building of the nation myths, Saint Patrick was seen to need a legend parallel to Saint George slaying the dragon and Saint Marcel delivering Paris from the monster. Saint Paul in the epistle reading at our closing Eucharist, calls on us to renounce the shameful things and to turn our backs on cunning practices, to be conscientious and truthful [II Corinthians 4: 2]. But what snakes and dragons do you want to see expelled from Ireland? The greed that fed the Celtic Tiger? That racism that so discriminates against foreigners and refugees that it would be happy to have a present-day Patrick work in oppressive conditions that would be today’s equivalent of the slopes of Slemish, or reject the newcomer that comes with enthusiasm to share the Christian message … from Nigeria, Latvia, Lithuania or Romania, or perhaps just from England? And if so, do we take it to heart? And do we want to share it, with enthusiasm? The first reading this afternoon is going to remind us that we are all children of exile and calls on us to turn to God “with all your heart, and with all your soul” [Tobit 13: 6]. 4, Saint Patrick was not the first person to bring Christianity to Ireland. His role was as a co-ordinator and as a figure of unity – as bishops should be – to reap what others had sown, but that sower and reaper could rejoice together in a shared Irish Christianity, in one Church together [see John 4: 35-38]. Are we still committed to bringing Christianity together, to the visible unity of the Church? Or, are the lines we are going to say in the Creed this afternoon, “we believe in one, holy, catholic and apostolic Church,” just another tradition, something we are committed to but not willing to do very much about? How did you react to the election of Pope Francis I three years ago, on 13 March 2013? Do you remember how he asked the people gathered in Saint Peter's Square to pray for him before he blessed them? Were you positive enough in your reaction to pray for him too, to ask God to bless him in his new ministry, his new tasks, his new mission? And I could go on … Saint Patrick did not wear a mitre and green liturgical robes – certainly not in Lent – he probably never carried a crozier, he did not turn the people of Skerries into goats, he did not fetch water from a well in Nassau Street, and he certainly did not build Saint Patrick’s Cathedral in Dublin … nor, for that matter, Saint Patrick’s Cathedral. But please do not take me as one over-enthusiastic revisionist historian, nor as someone who wants to tear apart some of the cherished concepts that help to hold together our shared identity with all its diversity. Legends apart, let me summarise some of the positive things about Saint Patrick that have been underlying his story. Saint Patrick was enthusiastic about sharing the Christian message. If I said that the Christian message is not at the heart of the Festivities in Dublin next week, you might tick me off for being a killjoy. But we are less than joyful and increasingly reticent about sharing our faith in the marketplace today, something for which the disciples themselves are admonished in the Gospel reading this afternoon [see John 4: 34-38]. Saint Patrick was a unifying force for the varying strands of Christianity in Ireland. That was why he was sent on his mission to Ireland. But so often every one of the Churches in Ireland is so insecure in its identity, that we cling too often to the little things that make us different instead of rejoicing in the truly important things that we have in common. Saint Patrick knew what economic and social oppression were from an early stage in his life. Saint Patrick challenged the established order of the day. Yet he too was afflicted but not crushed, perplexed but not driven to despair, persecuted but not forsaken, struck down but not destroyed [see I Corinthians 4: 8-9]. Like Christ with the Samaritan woman at the well, who provides the context and the setting for this afternoon’s Gospel reading [John 4: 31-38, see John 4: 1-42 for the full context], Saint Patrick was affirmative of the women who came to him with their questions about religion, but who had been marginalised and who had been kept out of religious society and debate. Indeed, so affirmative was Saint Patrick that his detractors accused him of being beguiled by them. As the son of a deacon and the grandson of a priest, Saint Patrick could hardly uphold the rigours of clerical celibacy, or for that matter some of our moralising and negatively judgmental attitudes towards sexuality and gender today. Saint Patrick is a pastorally sensitive and healing figure. I was reminded of this aspect of his character when I saw how Pope Francis is a pastoral Pope, sensitive to the needs of the people, preferring God’s preferential option for the poor rather than power and authority, not turning away single mothers who bring their children to baptism, embracing HIV + patients on their deathbeds in hospitals. It has been said he is following in the humble footsteps of Saint Francis of Assisi. I pray and I hope. And I pray and I hope too that he follows in the footsteps of Saint Patrick, the real Saint Patrick. Previous reflection, 1, Who is Saint Patrick? Next reflection, 3, Celtic Spirituality. Is there something there? (The Revd Canon Professor) Patrick Comerford is Lecturer in Anglicanism, Liturgy and Church History, the Church of Ireland Theological Institute. This is the second address at a Diocesan Readers’ Lenten retreat on 11-12 March 2016.